All weekend, I geared up for the day's severe weather event. I had planned on traveling a couple hundred miles, though. That is nothing compared to how far some chasers travel. I was expecting the severe weather to be at the Iowa-Illinois border between Dubuque and the Quad Cities after storms started to pop by Cedar Rapids. Little did I know that my chase would start from my backyard. As we approached the storm, it was incredible. I have never seen a storm like this in Iowa before. 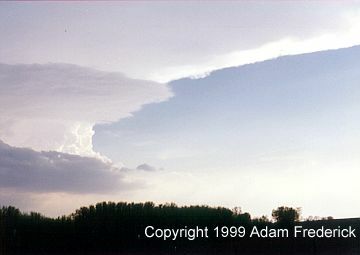 This was a huge supercell thunderstorm. It was about 2 to 3 times larger than any Iowa storm I had seen before. This looked like something that I had seen in Kansas and Nebraska before. The storm was over one county wide. That is why they issued a 3rd warning. We made it to Garrison and took the paved road south before the storm got there. Matt and I drove south about 3 miles when we felt we were clear of the storm's path. It was now to our north and we were on the back end of it. The motion in this storm was incredible!!! Usually in Iowa you have to really look hard to see motion in the clouds. Today, unless you were totally blind, you could see the motion. The power and turbulence you could see was breath-taking. Little did we know that a 2nd storm was developing behind this one. This is a close-up view of the funnel in Eastern Benton County. We were in the position that was mentioned in the above severe weather statement. This area was rotating and was trying to drop to the ground. Every once in a while, a dust cloud would rise up from the ground. Because they were such brief touchdowns, I only got the following one on film. Can you see the tornado??? Click here if you can't. We followed the storm east until we were in Fairfax. 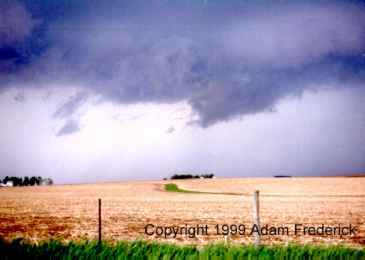 The storm was producing multiple funnels and even this rotating wall cloud that is in the background. This picture was taken in Fairfax facing toward the north at 4:15 PM. At this point, to have continued chasing this storm we would have had to drive through a more heavily populated area. 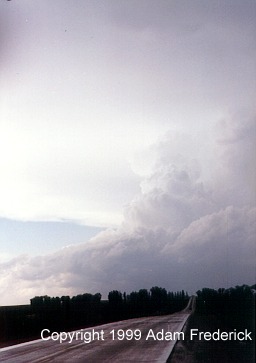 At this time we decided to chase after the storm that had formed to the west. This was how the storm looked as we headed back toward Vinton. 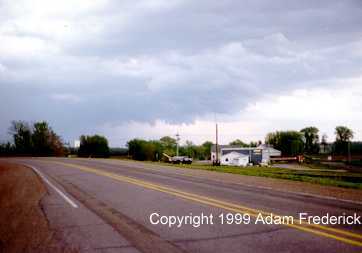 This was the second tornadic supercell that moved through Vinton that day. 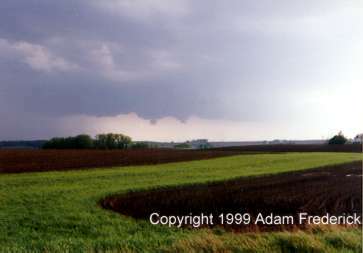 At the exact same time I took this picture while I was about 15 miles from Vinton, my parents took the below picture from my backyard. 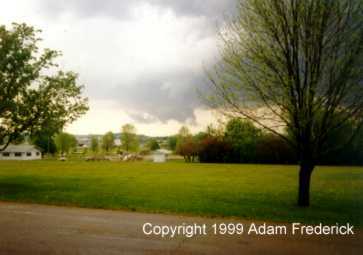 This is a picture of a dissipating wall cloud. From reports, this cloud at one time was solid. 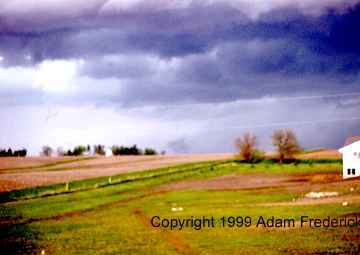 This was the second wall cloud that day that could be seen from my backyard. At the same time I took the above updraft picture, I turned around and took this picture of the storm we had chased earlier. At this point, it was dropping baseball sized hail. As shown by the following warning, it was still tornadic. I finally caught up to the storm over Vinton. It had a set of funnels that just seemed like they danced around the sky. After this, I continued the chase a little longer but decided to abandon the chase after being sandwiched between two supercells for over two hours.